It all came down to the vision for the Fruitville Initiative, a years-long community process to create a signature look for the area considered the gateway to Sarasota County from Interstate-75. 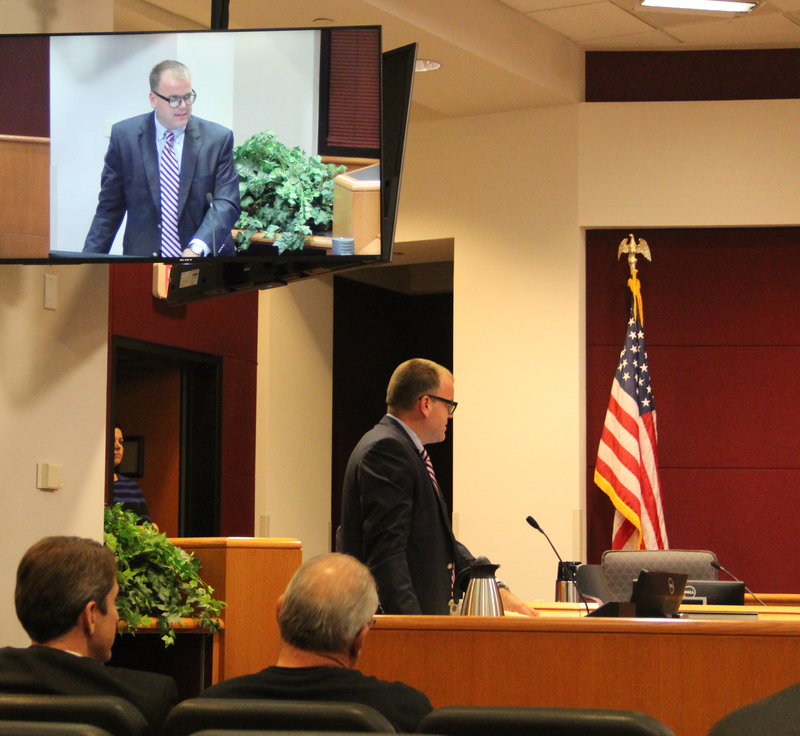 Benderson Development’s director of development, Todd Mathes, was appearing before the County Commission on Oct. 28 to seek rezoning approval so the firm could deviate from regulations crafted for the Fruitville Initiative. 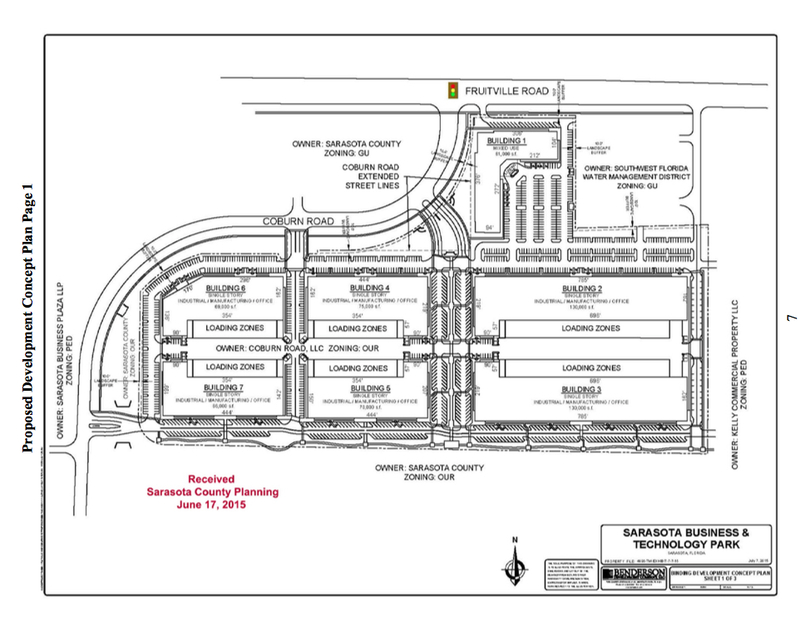 Benderson wanted to modify the design of its light industrial manufacturing and mixed-use project for a 42-acre site adjacent to the Fruitville Library and the Celery Fields, which it purchased from the county in the summer of 2014. The sale price was $3 million, with Benderson agreeing to another $1.35 million for the expense of fill material. Benderson sought to reduce the number of public secondary streets, decrease the number of blocks from seven to two — thereby increasing the block size — and provide for a deeper setback of a mixed-use building that would front Fruitville Road. The first hint of how the vote might go came early in the public hearing, after county Planner Steve Kirk completed his presentation. “Might as well just deal with this right upfront,” Commissioner Paul Caragiulo began. “Anybody understanding a very synoptic version about what you just said, how we might or might not feel about form-based codes, how we might or might not feel about New Urbanism and all these quote-unquote smart growth principles,” Caragiulo said, would ask how Kirk could square the proposed changes with the principles of New Urbanism. “Well, I don’t,” Kirk replied, referencing the material he provided to the board in advance of the meeting. “[The Benderson proposal] is a departure from those standards. … The traditional town center design envisions a main street that has a mix of uses,” Kirk said, with primarily retail businesses on the ground floor and upper-story offices and residences on the main street. “They really don’t meet that design concept,” Kirk continued of the Benderson plans. The Fruitville Initiative was structured so those design concepts would be met, he added. Therefore, Benderson had to submit its application to change the zoning code if it wanted to pursue the project as planned. When Caragiulo clarified that the Benderson proposal represented “basically, a more conventional development scheme for a parcel,” Kirk said that was an accurate assessment of the light industrial portion of the plan. In response to a question from Commissioner Christine Robinson, Deputy County Attorney Alan Roddy said that, according to county regulations, a petitioner cannot come back to the board with a new proposal until a year has passed following a denial or the end of any litigation following a denial. However, Roddy said, a petitioner can seek a waiver of that time period. 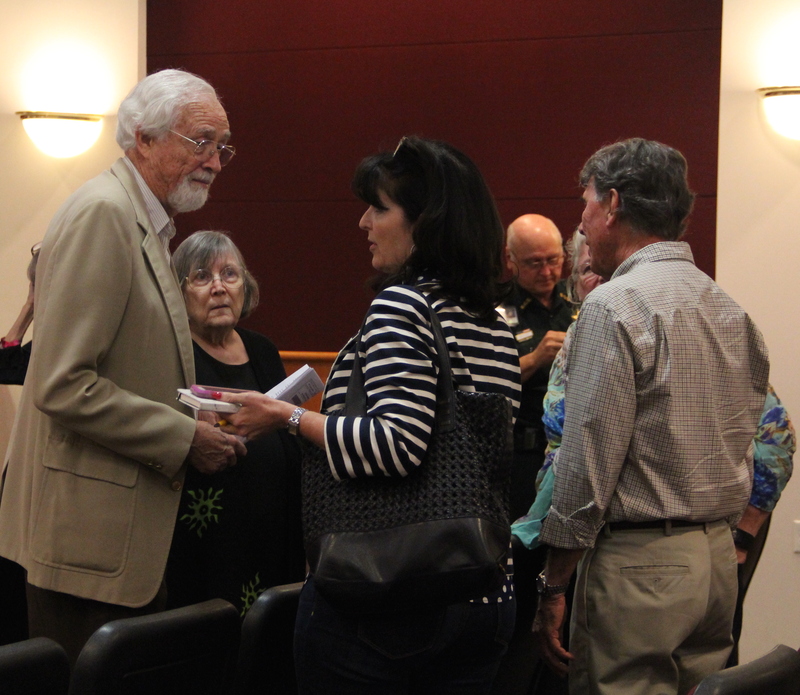 The Sarasota News Leader attempted to obtain a comment from Mathes after the hearing ended, but Mathes and the other Benderson team members rushed to the ground-floor exit of the Ringling Boulevard Administration Center, not stopping to speak with anyone. Mathes of Benderson Development told the board during the public hearing that, according to Future Land Use regulations for a major employment center (MEC) — the zoning under which the firm has planned for the site — Benderson is entitled to 516,000 square feet of space with a mix of industrial, office and retail uses as well as 300 dwelling units. However, the section of code that governs the Fruitville Initiative allows Benderson or any other property owner in that Initiative to change the uses at the administrative level, without having to appear before the commission. 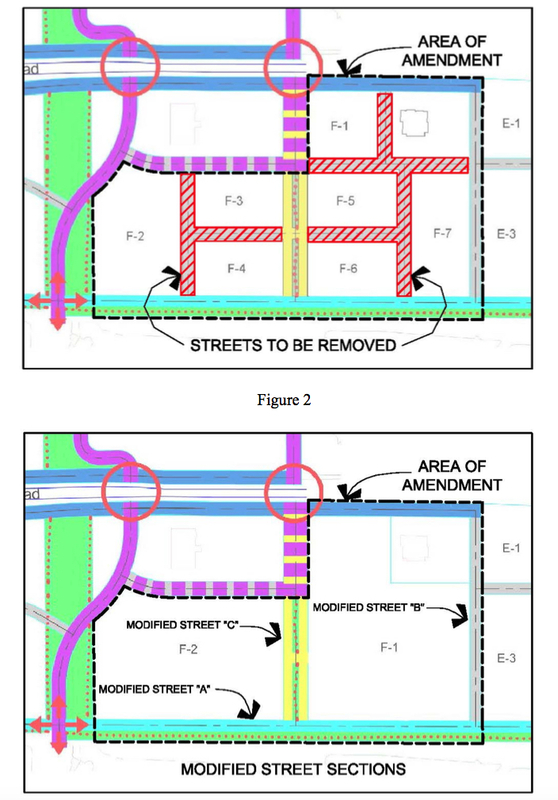 Mathes stressed, “We are not changing the use with this application.” The company is just proposing “a slight adjustment to how that street grid lays out.” Instead of creating blocks that would be four-tenths or five-tenths of a mile long, for example, the plan called for blocks that would be six-tenths or seven-tenths of a mile long. 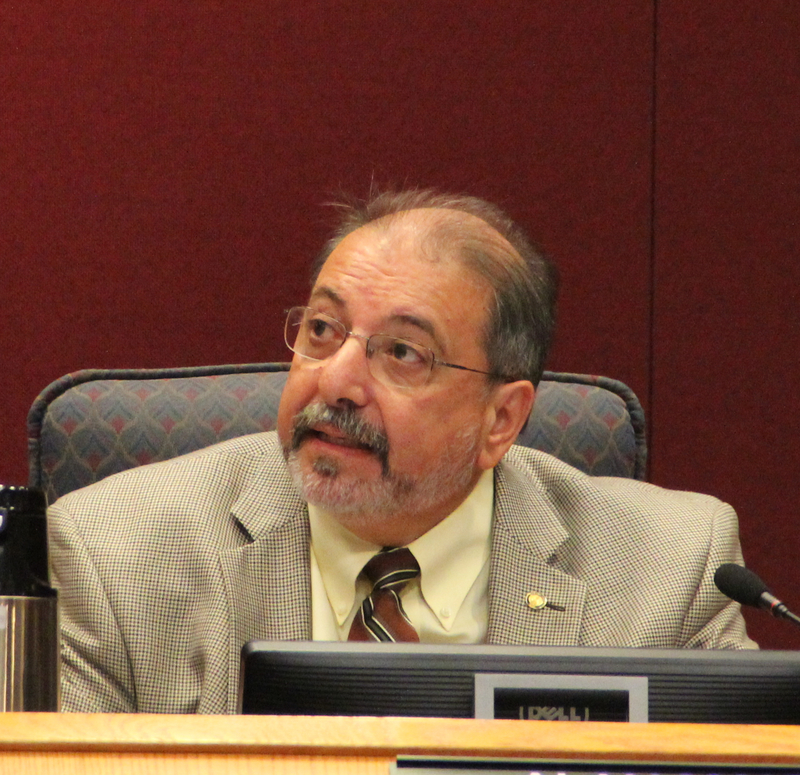 He added that the commission should not consider development under the Fruitville Initiative on a parcel-by-parcel basis but in the entire context, with mixed uses. “We have developed a strong main street,” Mathes added. “What’s different is that [one] street would be totally eliminated by the proposed buildings here,” he said, showing the board members a graphic of the layout. Further, he told the commissioners, “as we don’t particularly know where a door or window may go in the future,” the mixed-use structure fronting Fruitville Road would have green screens to indicate the potential locations of businesses. 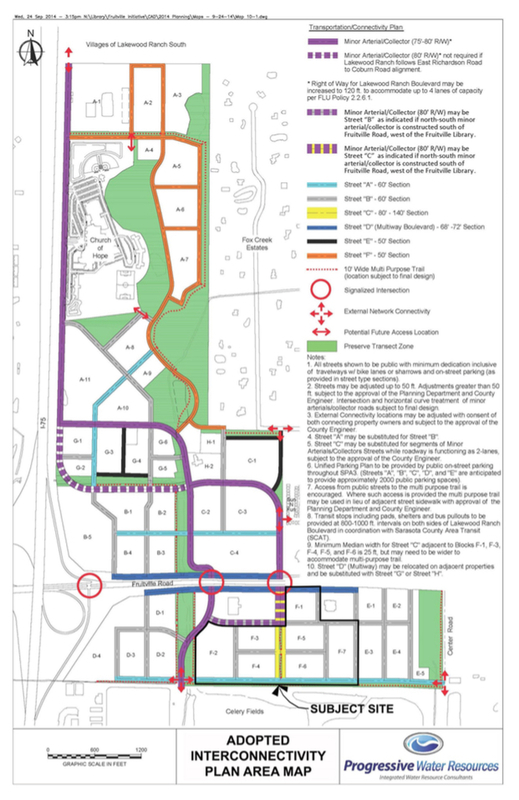 The main north-south street, which would connect with Coburn Road, would have sidewalks on both sides, Mathes continued, and landscaping would include shade trees and palms, “to make it a pleasant experience” for pedestrians. The east-west connector road would border the Celery Fields, he added. The site plan also called for a 10-foot wide paved walkway, a viewing platform the full length of the property “and a high amount of native landscaping to provide cover to the users of the Celery Fields,” as well as foraging sources for the wildlife that frequents that natural area. The 50-foot-wide linear park at the rear of the property, the east-west connector and the building on Fruitville Road will be in the first phase, he added. When Commissioner Charles Hines asked for clarification about whether the project would feature a mix of retail businesses, Mathes replied, “We are not giving up our allotted retail square footage” for the project site. Some of the firms utilizing the warehouses, he continued, would be expected to have retail storefronts, for example. “Is it something that people are actually going to walk to and use as a town center?” Hines asked. Further, would people have to “fight tractor-trailer traffic?” he questioned Mathes, referring to the trucks expected to come and go regularly because of the businesses using the warehouses. The project team “went to great lengths,” Mathes replied, “to ensure that [the design] is very inviting. No trucks will be traveling along the road at the rear of the property, he added. “This is not going to be a truck stop,” Mathes responded, pointing out again that industrial uses are allowed on parcels in the Fruitville Initiative. The biggest difference is that the revised plan calls for two large buildings in place of four medium-sized ones, he said, noting that the larger structures would provide better protection for the activities in the Celery Fields behind them. Mona Baker, another member of the Fruitville 210 Alliance, told the board, “‘No big boxes’ was the mantra” during the Fruitville Initiative planning process. Sarasota architect William Zoller told the board that, based on his review of the Benderson application, the buildings — which are proposed to be 40 feet tall — would take up 33 1/3 percent of the site, equivalent to the square footage of 10.4 football fields with the end zones. In comparison, he said, The Mall at University Town Center — also a Benderson Development project — comprises about 800,000 square feet. All but one of the 23 speakers voiced opposition to the proposed zoning changes. 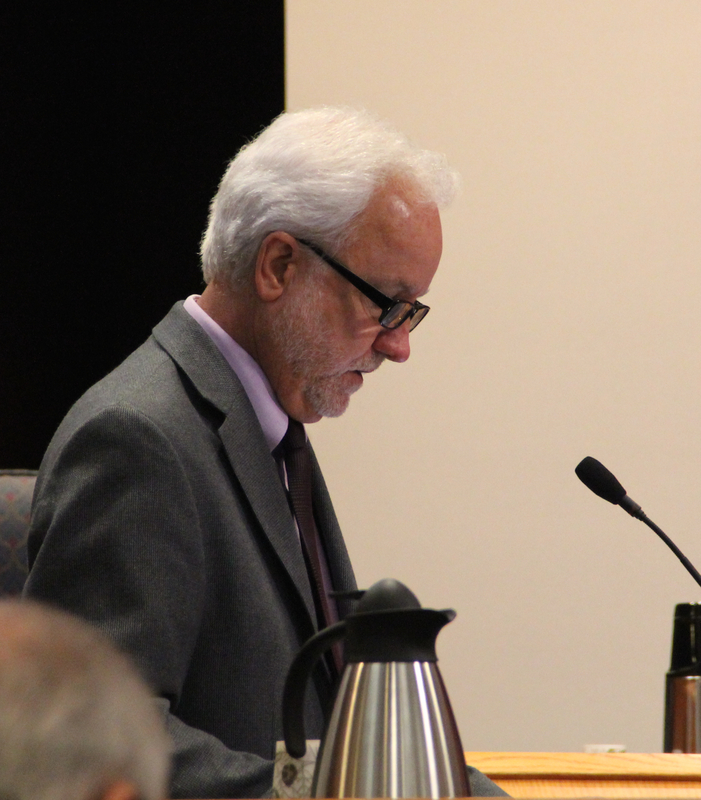 The sole person who did not was Sarasota attorney Morgan Bentley of Bentley & Bruning, who was representing an adjacent landowner; Bentley submitted to the board an agreement about utility access upon which his client and the Benderson team had agreed.